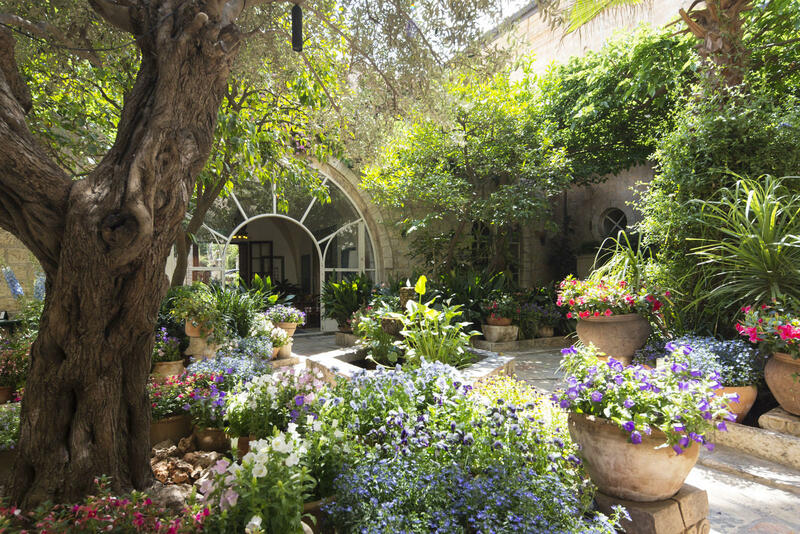 The pride of owners and the joy of guests of The American Colony Hotel in Jerusalem. Relax in the cool, shaded Courtyard full of flowers, take a moment under an olive tree in the East House garden or indulge in your favourite cocktail in the Palm House garden, now our Summer Bar. The Courtyard, located in the centre of the Main House, is the heart of the American Colony. Shaded by tall mulberry trees throughout the summer and cooled by a central fountain, this leafy outdoor area is home to the Courtyard restaurant. Adjoining the East House and one of the founders’ gardens from the early days, now an edible garden. Discover the hidden corners, linger by the fishpond or slow down in one of the other secluded seating areas. This is a functioning herb garden and from it our chef makes his personal selection daily for the kitchen. Adjacent to the Palm House, this glorious garden is home to the famous Summer Bar with its sumptuous barbecues and exotic cocktails. The garden has many secluded areas with seating, where you can enjoy drinks from the bar and the pleasure of a quiet chat.